For this album, early music specialist Jeannette Sorrell and soprano Amanda Forsythe have selected ten soprano arias from nine Handel operas Orlando, Almira, Serse, Partenope, Giulio Cesare, Ariodante, Rinaldo, Alcina, Teseo interspersed with four dance movements from the ballet suite Terpsichore. Titled The Power of Love all of the arias that lyric soprano Forsythe performs are connected by the theme of love in its various forms. Forsythe is in consistently fine voice with her sweet toned and often smooth soprano lending itself well to the varying emotion states of Handel’s love-struck heroines. A highlight is the much loved aria Da Tempeste from Giulio Cesare with the soprano competently negotiating the tricky coloratura demands and expressing Cleopatra’s conflicting emotions with ease. Another standout track is the admired coloratura aria Tornami a vagheggiar from Alcina with Forsythe convincing as the flirtatious Morgana and in most attractive voice too. Especially striking is the soprano’s sustained high note at point 2.34 (track 11). From Rinaldo there is a deep anguish to Forsythe’s persuasively depiction of Armida hurt by her unfaithful lover in the aria Ah crudel! In Geloso Tormento from Alcina Forsythe makes a convincingly jealous and tormented Queen of Castile. There is some lovely playing here in the prominent oboe part. Occasionally in Forsythe’s high register there is an uncomfortable almost piercing quality to her voice when strained such as the opening aria Amor è Qual Vento from Orlando. Jeannette Sorrell perceptively directs period instrument ensemble Apollo's Fire – the Cleveland Baroque Orchestra – from the harpsichord. Throughout both the aria accompaniments and the instrumental ballet pieces Apollo's Fire provides a fresh and lively feel to its playing with appropriate expression. Individual intonation and unity of ensemble is satisfying too. A bonus is the helpful booklet notes written by Jeannette Sorrell that include a short explanation of each aria in the context of the opera. Sung texts and English translations are provided but for some reason of the text to Amarti si vorrei from Teseo is absent. Recorded at St. Paul’s Church, Cleveland Heights the sound quality is a credit to the engineering team. In the catalogue there are number of high quality albums of Handel soprano opera arias notably from Sandrine Piau/Christophe Rousset/Naïve; Renée Fleming/Harry Bicket/Decca and María Bayo/Skip Sempé/Naïve. 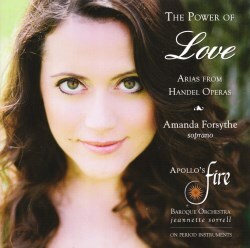 I can’t position this Amanda Forsythe album The Power of Love in that exalted company nevertheless it’s an enjoyably performed and well recorded release that gives considerable listening pleasure.